When most people think of the “Golden Age” they are referring to the 60’s and 70’s when Roller Derby was on 110 TV stations in the US and Canada, and we filled huge arenas and stadia and everyone knew Joan Weston, Charlie O”Connell, Ann Calvello, Ken Monte, Carol Meyer, Tony Roman, Mike Gammon, Judi Mcguire and many more as the superstars of Derby. These people were in 10 million living rooms every week because of the games we videotaped and shipped around to all locations. Collage with elements by lilie from stock.xchng.com. And most of these great skaters had become interested in the game because of the early television from New York and Chicago in the late 40’s and early 50’s. My fond memories are from the late 30’s until my Dad took it into New York for the first big explosion. As I stated in an earlier post (Roller Derby in Hollywood), I first saw the game in the glamorous movie capital of the world, and these skaters were bigger than life. Wes Aronson was the golden boy, built like Charlie O’Connell but movie star handsome and an effortless skating style. He was publicized as dating Eleanor Powell, a movie dancing partner of Fred Astaire. I think however, that even at that time he was married to his beautiful skating partner, Kitty Nehls. There were the fabulous Atkinson boys, Tommy and Buddy. Tommy again movie star handsome and skated the track better than anyone ever; he never used a shoulder or body block but was able to control the pack with his hip block. Buddy was a choppy skater who made it on effort rather than talent. And the amazing women: Ivy King was the first woman superstar. She skated in the first “race” in 1935 and looked so unlike a skater: diminutive, wearing glasses while skating and yet with amazing ability. It wasn’t until she was 90 at the 70th anniversary dinner in Chicago (where I first met Val Capone and the Windy City Rollers) that I realized what a potty mouth she had. A great sense of humor with one really raunchy joke after another. During warmups the men and women squads would skate together; first the visiting team, then the home team, in their beautiful uniforms, the women wearing capes during warmup. At the end of the session, the team would form into a pace, flying along in the five stride all together, high on the straightaway, low into the turn, moving so fast they seemed a blur, and the sound of the wooden wheels on the masonite surface caused the audience to pause from whatever they were doing to become aware of the power of the athletes on the track. The game would begin, with the men skating first, a fifteen minute period, followed by the women, then the men again and finally the women ending the half. The trackside announcer would bring the audience to a fever pitch, calling attention to what the athletes were doing and focusing on the stars. Oftentimes there was music during the jam, with stimulating classics like the William Tell Overture, Flight of the bumble-bee, 1812 overture, etc. At halftime there would be an “Open House” where skaters would perform various talents such as singing, dancing, etc, and the audience would show their approval by throwing coins…these skaters were making only $25 to $100 a month, plus food and lodging, so everything helped. Billy Bogash and Buddy Atkinson would perform a jitterbug dance which would bring the house down. Then the second half would begin, with the women’s period first, and three succeeding periods with the men skating last. The final score was a total of the each men’s and womens’ teams. Generally married couples or skaters who were going together would have the same number; Buddy Atkinson and Bobbie Johnstone would each have number 2, Gene Gammon and Gerry Murray number 10, Wes and Kitty number 12, and so on. No number 1 after 1937 to honor the skaters killed in the terrible bus crash. Bert Wall and Bobbie Mateer were married, as was Ken Monte and Toughie Brasuhn. Ken was a good ten years younger than Toughie, and it seemed at that time that the women skaters would latch on to the younger men: Loretta Behrens (and later Ann Calvello) with Charlie O’Connell, Mary Youpelle and Russ Massro, and so on. And skaters were given names and backgrounds to make them more individual in the eyes of the fans: Elmer “Elbows” Anderson was reputed to have been born in London and a concert pianist, Mary “Pochahantas” Youpelle was a full-blooded native American (?). Mary can be asked that today, if you like. And then there was “Ma” Bogash, whose doctor had ordered her to exercise (true) so she took up skating at the very old age of 42. My father thought she would be a great addition to the Derby, so he convinced her to join, but she only agreed if her undersized 16-year old son Billy could come at the same time. Of course he became one of the greatest of all athletes in the game and was one of the first inducted into the Hall of Fame. And the names that have been lost: Gertie Scholls, all the Gardners, Bob Satterfield, Paul Milane (who skated for Mickey Rooney in “Fireball”) and on and on. And how I remember the great Mary Lou Palermo…..please forgive me for those I don’t list. Today’s game and its empowerment factor are wonderful and I so appreciate it, but realize every time I see anyone on skates, I go back to 70 years of affection for the players of the wonderful game. If you want to read more about this era in what modern-day fans and skaters are calling “the best coffee table book ever” get your copy of Roller Derby to Rollerjam, covering the game with great writing and photos from 1935 to 1999 at http://www.rollerderbycommish.com. 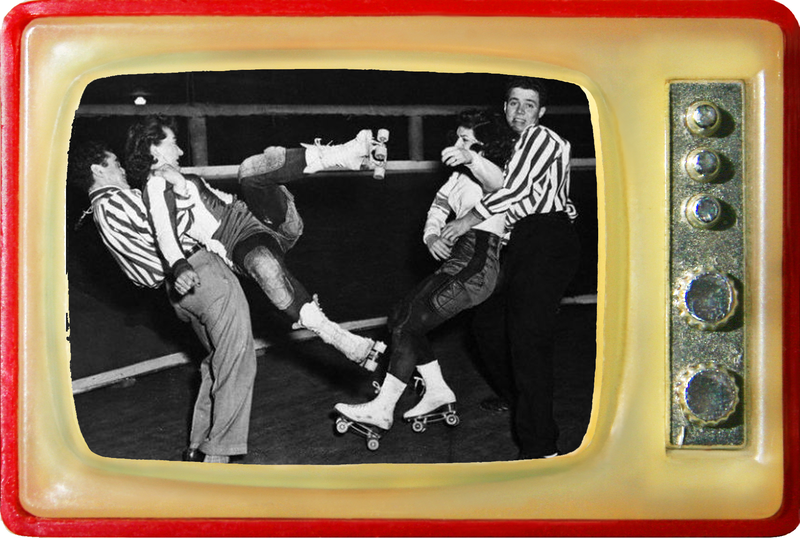 And now the brand new “Bay Area Roller Derby” by Keith Coppage and me takes you from the 30’s up to modern Day Derby. Available at all book stores and amazon.com. And to subscribe to my postings, add your email address to the box at the top right of this posting. I loved this post and reading your memories about the greats of the game. They were the pioneers and they forged the way for the O’Connells, Westons, Arnolds, and Gammons who followed. Thanks for the memories, Jerry!! I don’t know about Mary Youpelle, but Jean Porter actually is/was a Native American. One thing that’s incorrect about her in the earlier programs and the announcer spiel was the claim that she was from Buffalo. She joined Roller Derby in Buffalo, but was actually from a tribe in Ontario (I’m drawing a blank as to which one). I don’t know if the Buffalo story was just a mistake that it was too late to correct, an attempt to make her a native of a city where derby tour visits did well (the white team pretending to be from Buffalo had a name, the Buffalo Bisons before the teams got names to go with the cities in 1951 or so), or if it was about citizenship and work papers. I found a scan of a 1960s Roller Games program which gave her married name and mentioned where she was actually from. If my citizenship thought was correct, her marriage may have provided her dual-citizenship so she could work here legally. Or they just didn’t have years of programs/announcers saying she was from somewhere else? A skater in my league (Stonewheelz Stella) has family in that tribe and they’d mentioned to her that there was a member who’d skated derby. Stella was amazed when I produced DVDs of her skating in the 1950s (along with her short film). Her cousins always come to watch when she’s skating a game in Kitchener or Hamilton. Jean Porter was from Canada and was Oneida and Mohawk. She joined Derby as a teenager in Buffalo and ironically skated for the Chiefs and the Braves. A documentary (Roller Derby girl) was made about her in 1949. She currently makes jewelry and you can read her blog at http://www.derbymemoirs.bravepages.com/jean.html. Most people see the Golden Age as being whenever they started watching it. They assume the rules and the gameplay were always the same as when they started watching it. That goes for fans of both kinds of derby. Although there’s probably more video of 1952 and 1959 derby than 1973 derby, the latter is what seems to be selling fastest on eBay (based upon what the sellers offer). That and David Lipschulz’s IRSL shows. It’s a reasonable assumption to say that what sells is what gets offered. Classic derby fans want to see the derby and the skaters they remember watching. There’s always an IRSL DVD or two for sale, the WSL discs get offered a fair bit less often. Fewer fans watched that show BITD, so it’s less interesting to them. Likewise with your own 1959 Derby season (which I got from Steve Cole). The derby historians will tell you it was a better season of Derby than 1973. Almost no “heat” or theatrics, and better skating. But the fans who grew up in the 60s and 70s don’t appear to be as interested in it. With all due respect to the Commissioner (or even those who claim inaccurately the ‘Golden Age’ is whenever they watched…), most true fans and historians of Roller Derby would refer to the late 40s/early 50s as the sport’s ‘Golden Age,’ while Jerry’s successful stewardship, thru the 60s till the end of the original Derby in 1973, is often called the ‘Renaissance.’ Leo’s Derby captured the imagination of an entire nation with the sport and skaters featured in every magazine and newspaper, while Jerry’s years catapulted the sport into an unknown stratosphere where even the most staid members of the sports press establishment embraced the phenomenal success and uniqueness of Roller Derby as it packed arenas all across the country. Leo’s creation, the skaters’ commitment to their craft and Jerry’s superlative efforts with the sport keep it shining after all these years.